Meeting point at Dievole Wine Shop. If you’re searching for an authentic Chianti Classico experience, if you really want to get to know the history and soul of one of the most beloved winemaking regions, we suggest you book this tour. Thanks to our Dievole Wine Tasting Tour you will see quite clearly that our present is firmly rooted in the past, in a tradition of hard work and respect that shines through our territory and all of its elements: the land, the vines, the olive tree – our philosophy further inspires all of our employees to safeguard and tend to our estate with joy and dedication. After walking down one of our “white streets” lined with its signature cypress trees, you will find yourselfhhh in Dievole’s medieval hamlet, where our sommeliers will welcome you into the wine shop. 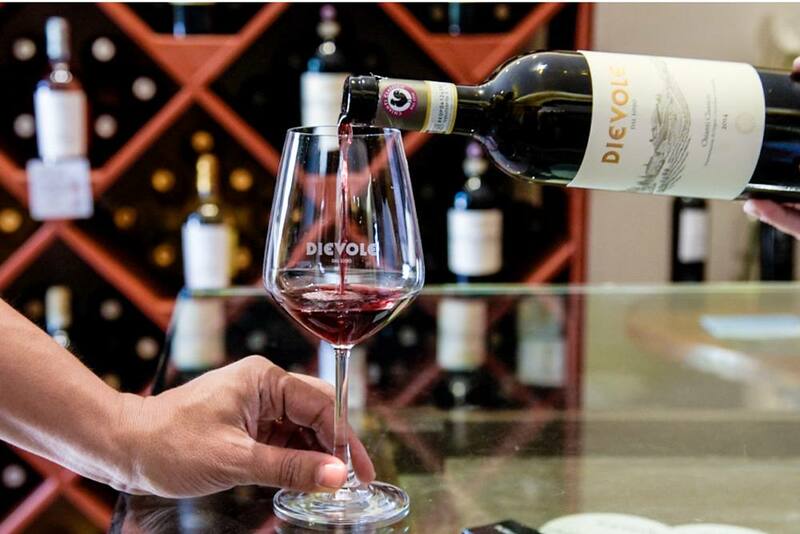 Here, an unforgettable experience awaits: the Dievole wine tasting tour will start with our IGT wines, followed by a visit to our cellar where you will swirl and savor Dievole’s finest Chianti Classico DOCG. In the elegant ambience of our cellar, we will also explain our sustainable production system. Here at Dievole, we cherish and respect our terroir and safeguard the preservation of our grapes’ natural qualities. This guided tour and wine tasting> would not be complete without a tasty serving of seasoned Tuscan Pecorino cheeses and local fresh bread drizzled with one of our prize-winning extra virgin olive oils. Back in the wine shop, a pleasant “wine-themed” surprise awaits, specifically thought up and prepared for you by our sommeliers. For whoever might be interested in taking the sensorial experience to an even higher level, this Dievole tasting tour also offers the chance to book at our restaurant for lunch or dinner at a special price.